You know that feeling when you have lists of the lists of things you need to do? And you wake up in the middle of the night to add things to those lists? If you've got little pieces of paper and post-its everywhere, and the notes app open on your phone and computer all the time, this post is for you. Half the time I never even remember to go back and read my lists, because I'm too busy trying to do everything on them! This kind of BUSY is not very conducive to the feelings of comfort and joy that are SUPPOSED to come along with this beautiful season. But there's something I want to share with you that I think is going to help. 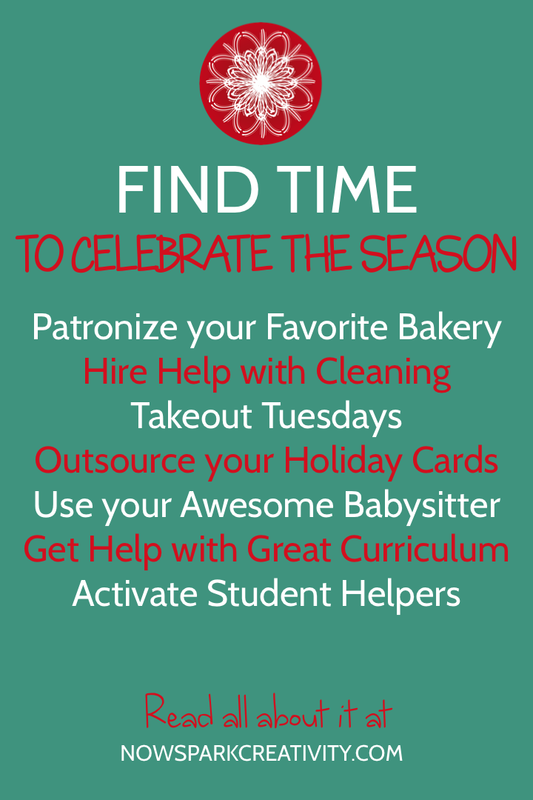 It's time to take back the holidays, teachers! This post is part of the a wonderful holiday blog hop put on by a creative and merry band of secondary ELA bloggers. Check out all the posts as they go live right here. As part of this fun blog hop, our group is hosting a raffle to win four wonderful prizes. We'll be giving away Barnes and Noble ($25), Target ($50), TPT ($100) and Amazon ($200) gift cards, so enter as many times as you wish in the Rafflecopter below, beginning December 1st. So let's get down to it. Did you see that New York Times article this summer making the intriguing claim "Want to be Happy? Buy More Takeout and Hire a Maid, Study Suggests"? I definitely did a double take with that headline. As I read, I found myself nodding along. We are so often willing to give up our time to make money, but then, even when we can afford it, we don't think to pay a bit to take back our time. Lately I have been feeling overwhelmed. On any given day there was work to do, two beautiful children to guide through life, the house to clean, voicemails to listen to, three e-mail accounts to check, shopping to accomplish, thank you notes or holiday cards to write, meals to make, a podcast to record. No matter how hard I tried, I always felt like I was failing to get to something. So I began to think, is there anything here that I could lift off my shoulders? Slowly I crafted a list. Maybe I don't have to have a birthday party for thirty kids when my son turns six in December. Maybe we could have his three best friends over instead. Maybe I could hire a babysitter for a few hours a week while I work on my podcast, instead of always doing it late at night. Maybe I shouldn't offer to host my school's holiday cookie exchange during my daughter's tricky twos period. And I got to thinking, what are some shortcuts we could ALL take this holiday season so we can really enjoy time with our families, our students, and ourselves? Just think of it. Wouldn't it be nice to really enjoy this time? So here they are, eight ideas for holiday shortcuts that will let you relax just a bit and enjoy these precious weeks. Having a party? Participating in a cookie exchange? Want to bring something tasty to your seniors who are stressing about college acceptance? Now, if you love baking, bake away. Pop on that apron and some holiday music and experience the glory of holiday baking! But if you don't, maybe this is the year you call up your favorite local bakery. The one with the small business owner that always takes the time to get to know her customers. The one who supports the local t-ball teams. Maybe you call up that bakery and order six dozen beautiful holiday cookies and save yourself ten hours and a lot of dishes. Seriously, guys, I have never heard ANYONE say "I hired someone to help with cleaning my house, but I'm really regretting it now." Maybe you just do it for December through February this year. Give yourself a break from feeling badly about how little you clean the bathroom. Spend that hour a week sitting in front of the fire with a good book instead. OK, so it probably wouldn't be very healthy for us to do this all year long. But in the busy month of December, would it really be so bad to hit Chipotle, pick up some Chicken Biryani, or zoom through the prepared foods section at Whole Foods a bit more often? Shopping and cooking can be a joy, but not in a time crunch. Every year I get out my address book and wing through for every person we know and care about. I address card after card, seal the envelopes, add the stamps. I don't mind. But it's one of those things elbowing for room on the to-do list. This year I couldn't help but notice that the company I made them with, Shutterfly, will actually send the cards for me. Which probably means they'd save the addresses of everyone I know and send them for me next year too. And the next. And they'd do yours. We have one babysitter that my son loves so much. He counts down the minutes until her arrival. Now, we like to think he's pretty fond of us too, but we are thrilled that he's happy for us to leave the house now and then while he spends time with her. 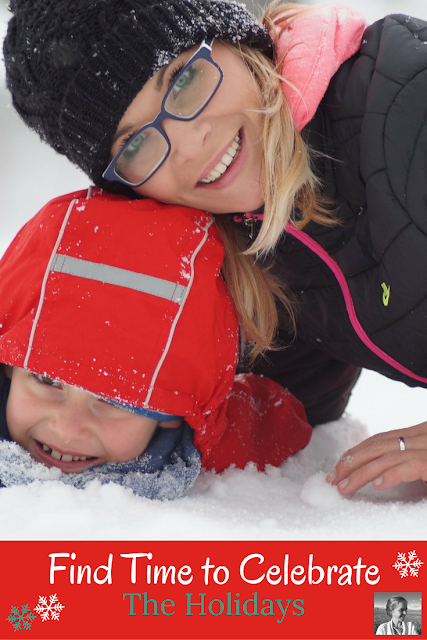 At this time of year, it's easy to feel like you should spend every moment with your kids and do all those things you have to do late at night after they go to bed. But maybe, just maybe, you could send them out to go sledding with their favorite babysitter while you finish your work so that you can enjoy a cozy evening watching Love, Actually later. Or they could enjoy pizza and The Grinch Stole Christmas with their babysitter while you wrap up final exam grading so you can really breathe over your vacation. Much as I love to wrap gifts, adding my own little ribbons and cards, I love not having to tape up box after box and go to the post office even more. Ordering your gifts online to be delivered directly from the companies to your loved ones far away makes it so much easier. I tend to get almost all my shopping done in one evening, online, popping in address after address to my computer and then never worrying about those gifts again. Writing curriculum is my favorite part of the job, so if I could, I'd definitely outsource grading instead. (If anyone can think of a way to do this, they'd make millions!) But since that isn't an option, picking up some fun lessons created for this time of year can really take the strain off. 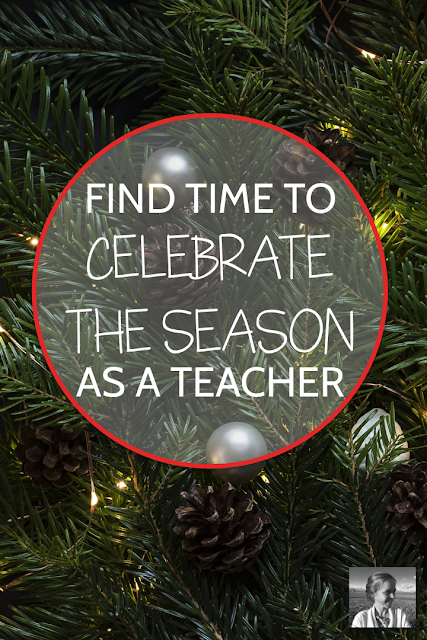 If your students are itching for something festive and you'd rather spend an evening decorating your tree or going to the nutcracker, you might check out some of these fun lessons from various secondary ELA TPTers. I had fun looking around for good ones! Does Greed or Generosity Define the Holiday Season? Another option would be to check out my post, Website Gold for ELA Teachers, and find a ton of free resources you can explore around the web. Or work with your teaching team and each create two days of fun holiday activities, then swap so everyone has a bunch of great material to work with. Want a merry classroom? Ask for help! Bring in material and put on an audiobook you've been wanting to introduce your students to from your free choice reading library, then invite them to help you hang lights, cut snowflakes, frost the windows, wrap the door, or whatever else you think would be fun. Not only will you save yourself the hours of decorating alone, your students will probably like the decor even more because they'll have ownership over it too. 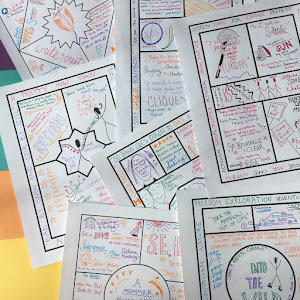 Looking for inspiration and support on your journey as a creative ELA teacher? Join my free Facebook group, Creative High School English. With a thousand members and more joining every day, there's always a good conversation going on. Finally, don't forget to check out all the amazing posts by other secondary ELA bloggers with ideas designed to help you bring more comfort and joy into your classroom this year. You're going to love what they've come up with for you. I'm right there with you - I sort of did a "huh" when I saw the title you mentioned. But you broke it down so nicely - it really is about what you're willing to give to take back some of the time and about the choices we make. Thanks for the important reminder, and I know I'll be taking some of these shortcuts and delegating a bit more during this busy time of year!